The executive assistant provides high-level administrative support to company Directors by conducting research, preparing statistical reports, handling information requests, following up of Director allocated tasks, minute taking and performing clerical functions such as preparing correspondence, receiving visitors, arranging events & conference calls and scheduling meetings for executives. Take responsibility for diary management by organising and maintaining diaries for the Directors of the company as agreed. Manage meeting logistics, arranging rooms & refreshments etc. Producing and collating high quality documents and presentations. Ensure that all action points are delivered by all Directors as per the agreed timelines and report this to the Managing Directors. Assist the Operations Board and leadership team with other administrative tasks and ad hoc projects. * You will be required to sign an NDA and sign legal documents to bind you relative to not disclosing company or personal information to any external or internal staff including Directors. This is a full-time position. Days and hours of work are Sunday through Thursday, 8:30 a.m. to 6 p.m.
Associate’s degree or bachelor’s degree. Five years of administrative experience. 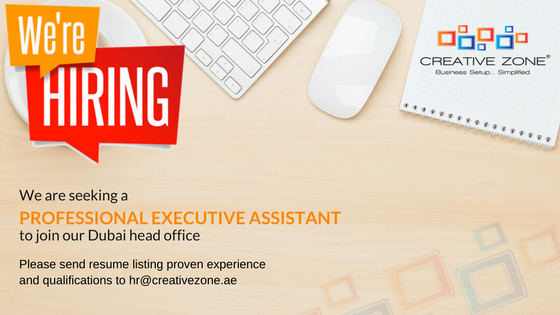 CREATIVE ZONE is the largest business setup firm in Dubai. Our team of company registration experts have over a decade of experience in the setup industry in the UAE. As we continue to grow, we are continually looking for exceptional and talented individuals to join our team.